Phytoplankton community in NWM – Nicolas Mayot, Ph.D. In the northwestern Mediterranean Sea (NWM) an intensive sampling effort was carried out between July 2012 and July 2013 (DEWEX experiment, figure 1). In the present study, the in situ observations of DEWEX were also combined with in situ data from monthly cruises at a fixed station in the Ligurian Sea (between 1998 and 2014). For this, a spatial division of the NWM based on satellite ocean color data has been used (in 2012-2013 this corresponds to the colored area in figure 1) to give a meaningful context to this analysis. Figure 1. Map of the NWM showing the location of cruise stations and of the DYFAMED/BOUSSOLE site. Colored areas indicate the spatial location of the two studied trophic regimes in 2012/13 (the “Bloom” and “High Bloom” trophic regimes, from [Mayot et al., 2016]). 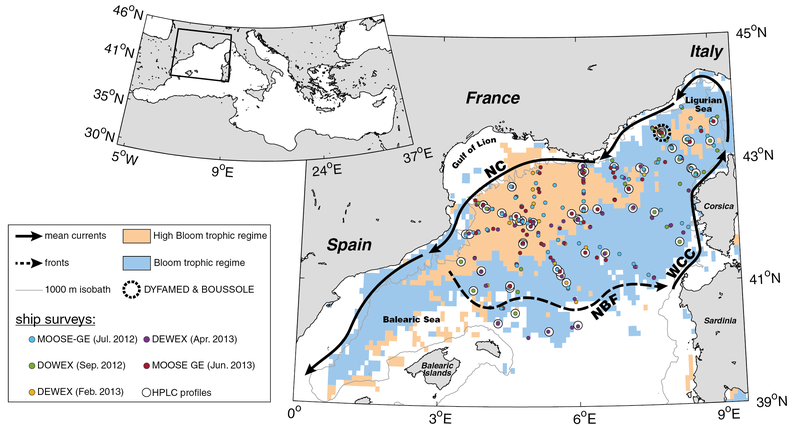 The mean currents are represented by arrows with continuous lines (WCC: Western Corsican Current, NC: Northern Current) and the North Balearic Front (NBF) by an arrow with a dashed line. By using these numerous in situ observations and a light-photosynthesis model applied to these data, we were able to construct pertinent annual cycles of physical and biogeochemical variables. 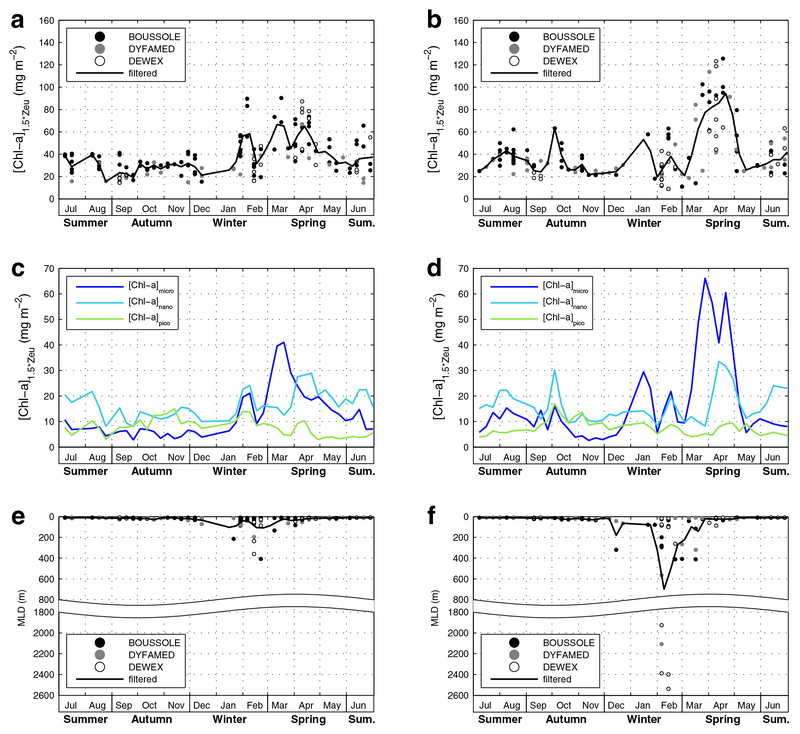 The influence of the depths of winter mixed layers on the seasonal and annual phytoplankton dynamics (i.e. biomass, community structure and production) have been characterized (figure 2). Figure 2. Climatological annual cycle of total and class-specific [Chl-a]1.5*Zeu and of the MLD, for the two studied trophic regimes: “Bloom” (a, c and e) and “High Bloom” (b, d and f). The total [Chl-a]1.5*Zeu is the sum of each (c-d) class-specific [Chl-a]1.5*Zeu: [Chl-a]micro, [Chl-a]nano and [Chl-a]pico (for the micro-, nano- and pico-phytoplankton respectively). (e-f) For the BOUSSOLE project (black points), the maximum possible MLD value is 400 m (the greatest depth of the CTD cast).